Personalized attention in a soothing atmosphere is key to dental care at Ascot Aesthetic Implants & Dentistry. Dr. Angela C. Ruff, Fayetteville dentist, and her team of professionals, have spent countless hours assembling a dental practice that delivers modern services compassionately and carefully. A member of the American Academy of Implant Dentistry and the Dental Organization for Conscious Sedation, you can count on Dr. Ruff’s excellent credentials to care for your every preventive, restorative and cosmetic dental need. Also, Dr. Ruff’s staff will help you feel your very best by welcoming you into their spa-like atmosphere. Tempur-Pedic dental chairs, massage therapy, iPads, noise cancelling headphones and other wonderful amenities relax you, pamper you and distract you from the work at hand. Dr. Ruff sees her patients every six months for oral check-ups, cleanings and digital X-rays. These preventive services keep ahead of problems or detect them early for easier treatment. The dentist looks for decay, gum disease, oral cancer, bite and alignment problems and the condition of your present fillings and crowns. 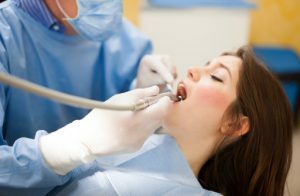 Damage through tooth decay, gum disease and oral trauma are unfortunate facts of life that your Fayetteville dentist resolves comfortably and precisely. Tooth-colored fillings, tooth replacement options, such as dentures and state of the art dental implants, top the list of restorative treatments at our dental practice. Of course, your dental experience at Ascot Aesthetic Implants & Dentistry would not be complete without considering your aesthetic smile needs. Do you have embarrassing stains and defects such as chips and gaps? Dr. Ruff can address those, delivering modern cosmetic services that fit your vision for your best smile. If you live in the Fayetteville area, you have a great choice for your dental care. Why not contact Ascot Aesthetic Implants & Dentistry? You’ll find that your teeth, gums and your self-confidence have never felt better!